Consistent lead generation is imperative if you want to stay in business. It's cliche, but customers truly are the lifeblood of your business. Generating leads can be a time-consuming and sometimes tedious process, but fortunately, nowadays, there is technology that can help do the job. Here are six digital marketing technologies that you should learn about to help you with this task. Programmatic becomes predictive when marketers anticipate consumer needs. Consumers now demand brands to offer always-on access and personalized experiences. A shift in marketing has now allowed marketers to delight consumers when they are most receptive. This is all possible because of real-time data and artificial intelligence. Predictive marketing gives you the power to be there when and where consumers want to engage. This technology brings together trillions of digital and real-world signals to create individual profiles and deliver personalized, immediate, relevant experiences to the consumer. When you predict and create these magic moments, you'll be rewarded with higher levels of engagement and higher return-on-investment (ROI). Market to people, not devices - Now you can anonymously identify and reach real people, instead of devices or bots. Focus on moments, not segments - Real-time optimization, with 26 artificial intelligence (AI) models per campaign, analyzing 500,000 attributes to score 120 billion daily observations. Master the customer journey instead of the marketing funnel - Predictive storytelling can help you deliver relevant, personalized consumer experiences in real-time. Own your data, don't rent it - Less than 10% of Rocketfuel's models use third-party data. This leads to accurate, cost-effective, models that differentiate your business and drive higher ROI. Make better decisions with your data. Rocketfuel uses its AI learning to determine who to target from analyzing your website visitors profiles. It then takes these profiles to begin targeting new prospects using display advertising placed on websites at the right time to get the targeted prospect to respond. We like to refer to it as digital direct mail, but even more powerful than print direct mail. You’ve probably experienced ads following you around once you’ve been on a website. This is technology that goes out and finds prospective buyers, then brings them to you. In short, forget about the old "spray and pray" advertising model of the past; you target the right person on the right device at the right time. If someone fills out a contact form for more information about your product or service, they're interested in buying. If you don't respond fast enough, they're going to move on to your competitor, especially in those businesses working with the consumer direct or business-to-business services where a prompt response is expected. Speak2Leads is a lead response management system. The system converts all online leads to phone calls to you or your reps. You're calling your lead back at a time when they are most interested in buying. And if you don't reach your lead on the first phone call, Speak2Leads has an easy-to-use automated reminder system that prompts your team to follow-up. Seamless integration with top-tier platforms like Salesforce.com, Unbounce, Infusionsoft, Hubspot and Zapier to name a few. Email parsing is also an option. Last but certainly not least, your very own Lead Performance Dashboard, allowing you to monitor rep response and results at a glance anywhere, anytime. The lead’s name and inquiry nature are provided, along with a “press/say 2” option to call the lead. Your reps are called at optimum intervals to ensure they apply the right amount of persistence to re-attempt to reach your leads. The end-result: more connections and more sales. S2L simplifies your life and boosts your sales. Responding to a lead within one minute of their inquiry increases connection chances by 500%. In 78% of instances, the first company to speak to a buyer closes the deal. Sounds crazy, but 27% of leads are never even contacted! Regular email follow-up and/or text messages between calls increases conversion rate by an additional 53%. An ExecTarget study showed that 70% of people preferred to get their marketing messages via email. Obviously, if you bombard someone with emails, that's going to be a turnoff. However, retargeting customers via other avenues can increase the effectiveness of your email campaign. You are probably familiar with retargeting. Did you ever notice that after you visit a website, you will be served ads relating to that product or service, even though you are on another website? Or some related item will pop up and you're wondering how they knew you were interested in it. That's because when you visited the original website, it contained a line of code that has tagged you for future targeting. Email retargeting works in a similar way. Anyone who opens your email is tagged by a line of code that can be in your signature or elsewhere in your html. When these same people browse the web, including social media websites, they are served up display ads as they visit various websites that are enabled for ads. You can retarget on different devices, as well. This keeps your message in front of your customers and prospects. This technique is able to get 50%-70% of email opens retargeted with display ads, regardless of whether it was a desktop or mobile email open. There are multiple reasons why you might use this technique. It reduces shopping cart abandonment. It creates an affordable drip campaign for those who are not ready to buy on the spot. It can help you not only sell, but cross-sell and upsell to your customers. It can also be used to retarget old customers to reconnect with them. As an added bonus, the extra traffic that you are driving to your website improves your organic search rank. Email retargeting allows a marketer to indirectly keep brand presence with another 25-100 impressions which cannot be achieved by email or direct mail without breaking the budget. Whether you want to take on a little (or a lot!) of digital marketing yourself, Vivial is a marketing platform with people behind it who can support you. What exactly is Vivial? It's a marketing technology service that offers a wide range of customer engagement tools to help businesses enhance the way they connect with customers, build loyalty, manage content, and track results. Businesses of any type can use this service to increase their visibility using turnkey solutions. Many businesses lack the time, budget, or even the desire to manage all the essential components of a digital marketing program. Instead of becoming mired down in the myriad details of social media management, owners and executives can get back to running their business while Vivial works behind the scenes to get results. Vivial can handle creating and publishing content—and marketers can use the platform dashboard to manage social media and monitor campaign results. Or, if you’re eager to roll up your sleeves, take control and start planning, creating and posting yourself—have at it. Either way, the support and tools you need to shoot your content directly to your desired targets, generate and respond to buzz on social media, and dominate search engine rankings is here. This technique uses the power of direct mail or direct marketing campaigns with personalized URLs (PURLs), personalized QR codes, or personalized emails for each customer or prospect that you are targeting. PURLs create a virtual face-to-face relationship with your prospects and customers. You address them as individuals via a dedicated channel like direct mail or personalized email and learn more about them instantly, whether they're new prospects or existing customers. The result is immediately improved response rates and conversions, plus steadily enhanced performance for your future direct marketing efforts. First, you send recipients direct mail offers that feature PeURLs. The platform uses your mailing list to create a unique, personalized URL for each direct mail recipient, then inserts the PURL into the mail file for seamless incorporation into the printed collateral using ink jet, laser, or variable data printing. Personalized URLs display the customer's name, offering positive reinforcement and increased incentive to visit your site. The result is a dramatic increase in direct mail response rates. Next, the respondent arrives at his or her personalized landing page, which maintains the design and tone of your direct mail package with a personalized greeting and pre-populated fields that help drive immediate response. The user learns more about your offer and can instantly respond to it, request additional information by email or mail, or even make a purchase without ever leaving their personalized landing page. Third, the platform record's the user's actions so that you can track the effectiveness of your campaign in real time, generate detailed reports, extend additional offers, and immediately follow up on sales leads. It's a winning, three-step strategy that delivers superior results while continuing to build upon your direct mail campaign. Studies show that 84% of direct mail recipients say they open direct mail pieces that have their name on it in both the addressing and in the content. With the options and quality levels for personalized printing today, marketers and customers are only limited by their imagination. Furthermore, there is less competition for space in the mailbox and smart marketing with personalized pieces exploits this. Okay, I know it's not what you expected. No software or special platform needed. Most telephones are digital, so I cheated to qualify this one. All you need is a customer list or lead list, maybe even an old one that you didn't make a sale on - yet. Depending on your business, sometimes it just makes sense to pick up the phone and connect. The phone is still a great customer service and relationship-building tool to ferret out any problems or leads. This is especially true if you have not heard from a business in quite a while. Raise your hand if you are guilty of this. Okay, my hand's up. But I'm improving in this area. By phoning, you might learn there was a negative situation you didn't know about. There are things you can pick up on in someone's speech that you can't extract from an email. This gives you the opportunity to fix your customer's experience of your product or service before you lose them to a competitor. On a more positive note, calling to check in on past business shows customers you value their business. A phone conversation may alert you to potential business you were not aware of that you would not get out of in email. If they are local, arranging to meet for coffee or lunch can help you strengthen your business relationship. 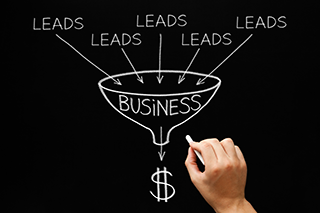 No matter what business you are in, generating leads is crucial to your success. Using some or all of these strategies will put more prospects into your sales funnel and increase your conversion rate and increase your revenues.